In order to maintain the technological edge in cellular monitoring systems, HSS' engineers are committed to keeping up with changes in cellular architecture. With an ever changing landscape of cellular phone services and service providers, it can become quite a challenge to intercept all types of voice and data communications. However, HSS engineers adapt, customize, and re-engineer our cellular monitoring systems to meet the needs of intelligence agencies. When mobile service providers offer new features, HSS engineering can adapt cellular monitoring systems to intercept those new communications intelligence attributes. Question: How often do we update our mobile intercept technologies? Answer: As manufacturers of mobile cell phone equipment come out with new products and new services, we aim to adapt the intercept parameters to include those changes. Updating intercept technology is essential as criminal and terrorist elements take advantage of new cell phone performance abilities. To date, HSS has met this challenge, offering options to intercept new technological advances in our communications intelligence in voice and data acquisition. Examples of new cell phone intercept solutions include features such as SMS Intercept, IMSI Intercept, and TMSI Intercept to name a few. Question: Are cell phone intercept systems upgradable? If so, how soon do they require an upgrade? Answer: It is not simple to make a universal intercept system, because cell phone intercept solutions are generally customized to operate in specific geographic regions. Yet because our new systems are able to accept multiple platform programming, some systems are upgradable. 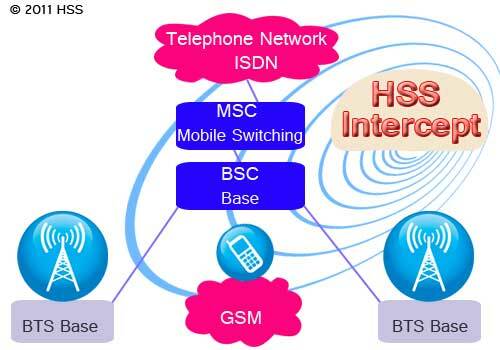 In the event that a new, unforeseen technology should arise requiring a reconfiguration of the cell phone intercept design, HSS is able to modify existing cellular intercept technology. To learn more about cellular monitoring solutions for cell phone intercept operations, Law Enforcement Agencies and their respective vendors may Contact Us.